Some good news for the future Crenshaw/LAX Line, one of the new light rail lines that Metro is currently planning: The U.S. Department of Transportation announced a $1.45-million grant to help design an intermodal transit center for the Aviation/Century station near LAX. The grant was originally supposed to go to Los Angeles World Airports, but there were some delays and with the grant at risk of lapsing, it was redirected to Metro. The Aviation/Century station will be a big one on the Crenshaw/LAX Line. Located at the northeast corner of LAX, the station will be serving both trains on the Crenshaw/LAX Line and also some trains coming up from the Green Line, not to mention the many bus lines serving the area. LAX officials have also said they plan to build a people mover to connect the airport terminal area to the train station, although those plans are far from finalized. It also remains to be determined whether new transit center replaces a smaller transit center for buses on the border of Parking Lot C, said Roderick Diaz, the project manager for the Crenshaw/LAX Line. The press release about the grant from the office of Rep. Jane Harman is after the jump. 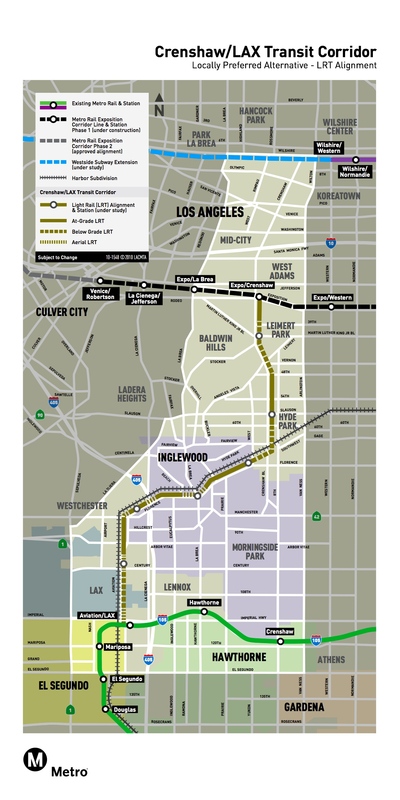 Washington, DC – Rep. Jane Harman (D-Venice) praised the U.S. Transportation Department’s $1.45 million grant to the L.A. County Metropolitan Transportation Authority which will be used to design the Intermodal Transit Center at Aviation and Century Blvd for the future Crenshaw/LAX line.